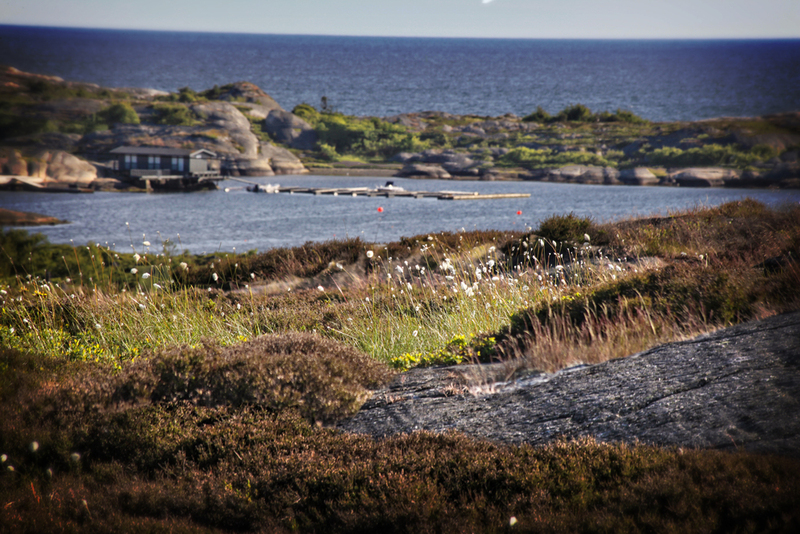 Few places by the Oslofjord are perceived as exotic as the southernmost inhabited Hvaler island - Herføl. Rarely has anything as unmasked been as beautiful as on Herføl. Flirtatious in the summertime, icy cold and naked in the winter, and harsh in its own exciting way. One is lured here to the crossing point between the outer Oslofjord and Skagerrak by nature, the rugged and beautiful rolling rocks, the country's largest burial mound, the spectacular potholes, and - of course - the delicious cinnamon snurrs at the café "På Posten". There is no car traffic on Herføl - only cries from the sea gulls, the muffled "dunk-dunk" from the occasional motor boat, or kids racing the outboard or rattling their bottles. There used to be a customs station and a pilot on Herføl, and it once was an important fishing center. Today Herføl is a summer- and tourist center. There are only 14 permanent residents on the island. The summer guests dominate in the summertime, but it is still not an island with many cabins - only 150. For those of us wishing to go for a walk along the coast, Herføl is a great discovery - all year round! Only interrupted by a few cabins, which are not annoying at all, one can have a walk for several hours - at one's own leisure. Polished rocks, several bays, pebble beaches, the country's largest burial mounds and the largest collection of spectacular potholes and a heather moorland reminiscient of Norwegian mountains provide highly varied experiences. There is a ferry from Skjærhalden on Kirkøy, and a boat trip to the Herføl main pier on the island's eastern side provides a starting point for wonderful walks. It might be a good idea to bring a bike to cover more ground. This is what it looks like where the ferry docks at Herføl. 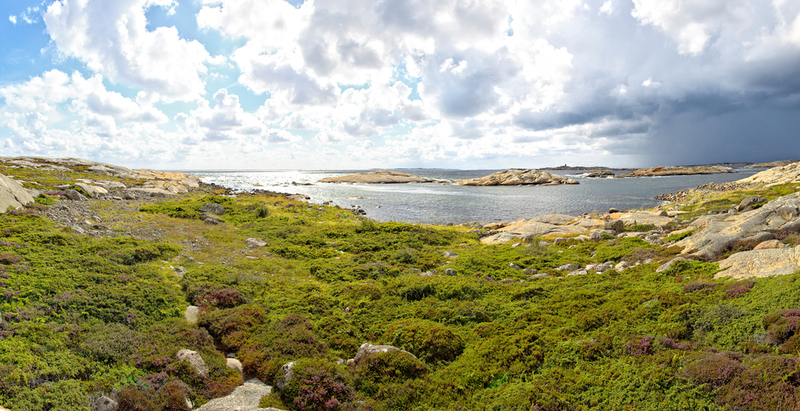 Herføl is an unusually beautiful and interesting island divided into two natural landscapes. You can draw a line from the northernmost point to the southern tip, and you have to different nature- and landscape areas; the tranquil and lush in the east and the rugged, wild and open to the west. The eastern part of Herføl is sheltered by the ridge dividing the island. Therefore, the eastern part is protected from the ocean winds that pound the western part. The island's eastern side has a tranquil archipelago scenery with forests, beaches, a great view of the Herfølrenna, the strait that separates Herføl and southern Sandøy. Most of the buildings on Herføl are located on the eastern side. To take advantage of the large parts of polished rocks, a powerful wind is preferrable, and the wind is rarely in short supply on Herføl's western side. All year round (watch your step when snow is covering the ground) it is a great experience to walk here in a strong southerly or westerly wind. It is a great experience to soak up the sun on the many rock shelves in the southwest that act as stands with the ocean as the stage. The shelves are also convenient to dive and swim from, or as solid ground for keen anglers. The island's network of paths is remarkably well marked. In open landscapes, as in the rocks and the large heather areas, there are no signs showing you the way, but some painted marks on stones do. And if you move outside the paths, you can find your way easily enough because of the open landscape. Besides, it just adds some "spice" to the walk having to find your own way. The enormous pebble beach on Herføl is a part of the origin of the Oslofjord Moraine stretching across the fjord to Vestfold and winding southwards to Jomfruland outside Kragerø on the coast of Telemark. "Herfølsåta" is a large burial mound from the Bronze Age and can be seen from far out at sea. It has a great view in all directions, which is just as it should be. Herføl is the saga island of Østfold. The name Herføl, in old Norwegian "Herfyili", means a gathering site for the army. The island was a central location even in the Bronze Age and saga time. All the Bronze Age burial mounds indicate this. "Herfølsåta" ("Røsset" colloquially) is one of the country's largest mounds, with a diameter of almost 30 meters. This is one of Norway's finest burial mounds where it sits on top of Herføl's highest point. It bears witness of faith and beliefs of the people at the time. Herfølsåta –burial mound from the Bronze age. Herfølsåta is one of Norway`s largest mounds. At the south of the island a rarity of a burial mound, about 100 meters long, "Langrøset" can be found. The burial chamber can be seen clearly, but you have to baloance your way there over pebbles. "Langrøset" is Norway's longest in its kind. Both "Herfølsåta" and "Langrøset" tell of the region's facinating Bronze Age history and make quite an impression with their age of well over 3,000 years. Another landmark which can be seen from far out at sea, is the 32 meters high Linnekleppen with a towering 9 meters tall beacon. The beacon is supposedly one of the most dominant in the archipelago. Linnekleppen is located south-west of the island, and if you walk up to the beacon you will be rewarded with a breathtaking view of the horizon to Skagerrak and Sweden with the Koster islands. It is easy to understand why many sailors use the beacon as a navigating point to the Hvaler archipelago. From Linnekleppen you can continue your trip south across the rocks to "The Cathedral", the big pothole shaped as a Gothic church window. A stunning landscape of rocks is next to the pothole. Enjoy all the rocks' forms and shapes created by the ice. The Ocean`s Cathedral. You will find many interesting potholes in the southern part of Herføl. You can swim or just sit in them. The picture shows the pothole “The Cathedral” or “The Whale`s Mouth”, as other may call it. It is a unique experience to swim from a beach wih an endless view of the horizon. Tøftebukta is a small and sheltered bay with a sandy beach. Stutehavna is located to the south and east. It has a landing pier and several smaller bays with sandy beaches. Gyltebukta with Gylteholmene near the south-east end of the island is a southern idyll with small islands and reefs. There are also some good fishing spots here. Vestre Gylleholmen has a great view from the beacon. Here is the monogram of the Swedish King Oscar II and the year 1904, the year before Norway left the union with Sweden. Stormona has a long sandy beach with a nice hinterland and is limited on both sides by shielding rocks. Grønnebauen is located in the western part of the island, a little north-west of Linnekleppen. Grønnebauen is shielded from the south-west, and has a nice sandy beach. West of Grønnebauen is the paradise Svanetangen which is the favorite spot for many of the summer guests at Herføl. Here are many potholes in very unusual shapes, almost sculptural. Idyllic Kaffebukta is just 500 meters north of Grønnebauen. A grass level provides space for games and activities. Swimming should be done from rocks or diving boards found here. If you have your own boat, we recommend that you go exploring Herføl's skerries on your own. You will then find small islands and idyllic coves particularly on the west and north side of the island. Especially Fløyholmen with its little "south pacific"-like beach and Ekholmen with the Hvalertuftene are highlights in this area. See map below for location details. Most of Herføl is being grazed, yet the island is about to be covered by forest. There are particularly many pine trees on the southern, central part of the island, and also some spruce trees. The deciduous groves in the north grow mostly on former farmland. Herføl's great son, Henry A. Larsen was born Andholmen at Herføl. He was the first to sail the Northwest Passage from the west to the east, and the first to do so without wintering along the way. Henry A. Larsen is famous in Canada, but relatively unknown in his native country Norway. Andholmen is located on the eastern side of Herføl, and is a nice and idyllic place with a cluster of old stately homes and sea sheds. Here is also the old customs station which was closed in 1976. 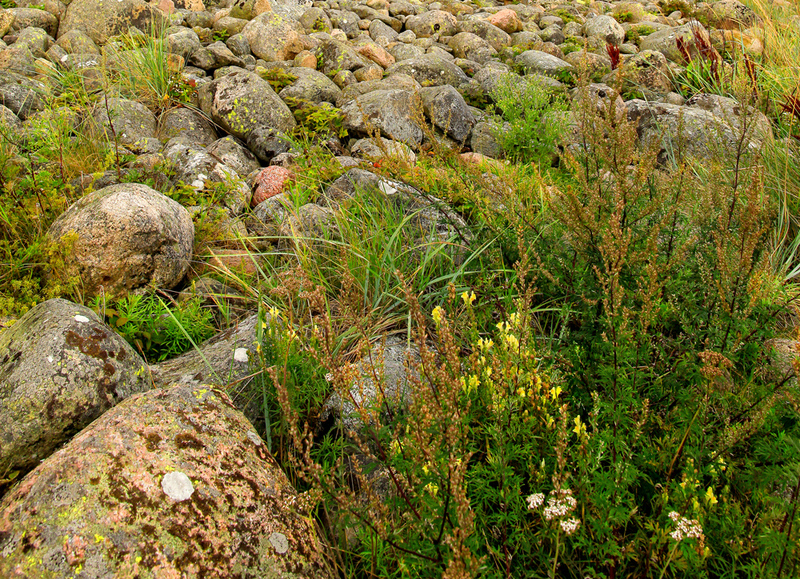 Some of the exciting aspects of Herføl's nature is the island's rich flora. Despite the fact that parts of the island are barren and harsh, there are rich types of vegetation and many rare plants to be found on this adventurous island. The highest density of plant species are to be found in areas with shell sand in the north-western part of the island. Two particularly valuable vegetation types are present on Herføl: red fescue, meadows, and calcareous meadows. Demanding plant species grow here, such as beach wormwood, Gentianella uliginosa, dwarf golden, hartman`s sedge, and Seaside Centaury. We end our excursion on Herføl by walking the last leg on the gravel road from Andholmen to the ferry next to the marina. The first part of the road passes through lush forest. After a while everything opens up and we are walking by beautiful white houses surrounded by gardens with fruit trees. Onboard the ferry back to Skjærhalden we can see Herføl, and we're processing all the nice impressions this lovely summer island gave us during our 24 hours close to the ocean. We were mesmerized by this pearl of an island, and we can very well understand that most people visiting Herføl return there time and time again. No one are untouched by what this magnificent and wonderful archipelago has to offer, and neither are we. And if we visit Hvaler again, we will surely return to adventurous Herføl.